I have a bag full of yarn left over from the dye experiments that I then used to knit with, which on their own weren't of a large enough quantity to knit with. 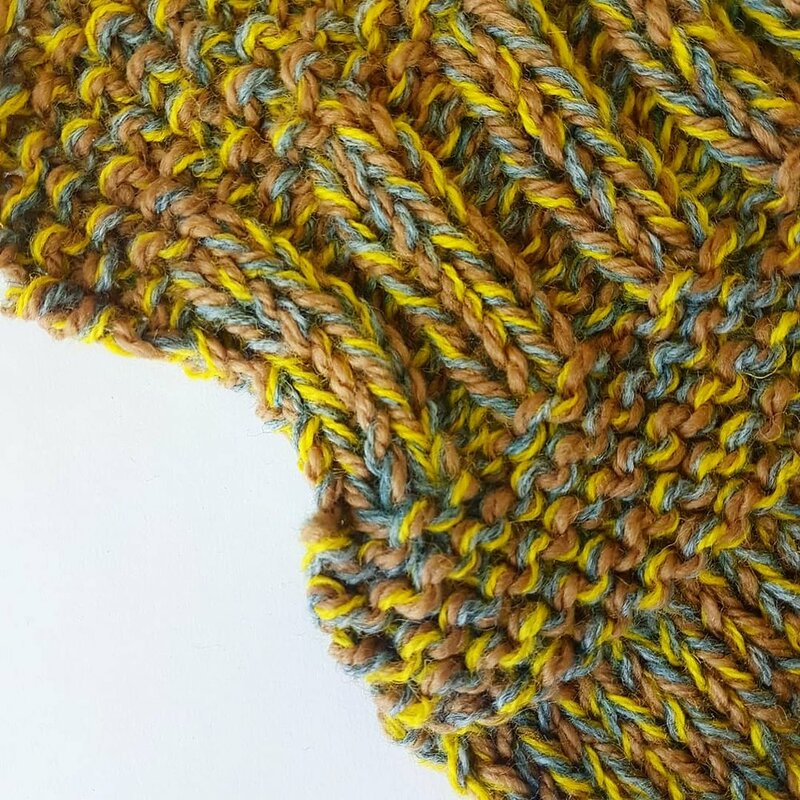 As I have started to introduce chunky hand knits into my work it seemed natural to want to combine the finer yarns into a chunky yarn, giving more scope for interesting interactions of colour, and preventing waste. 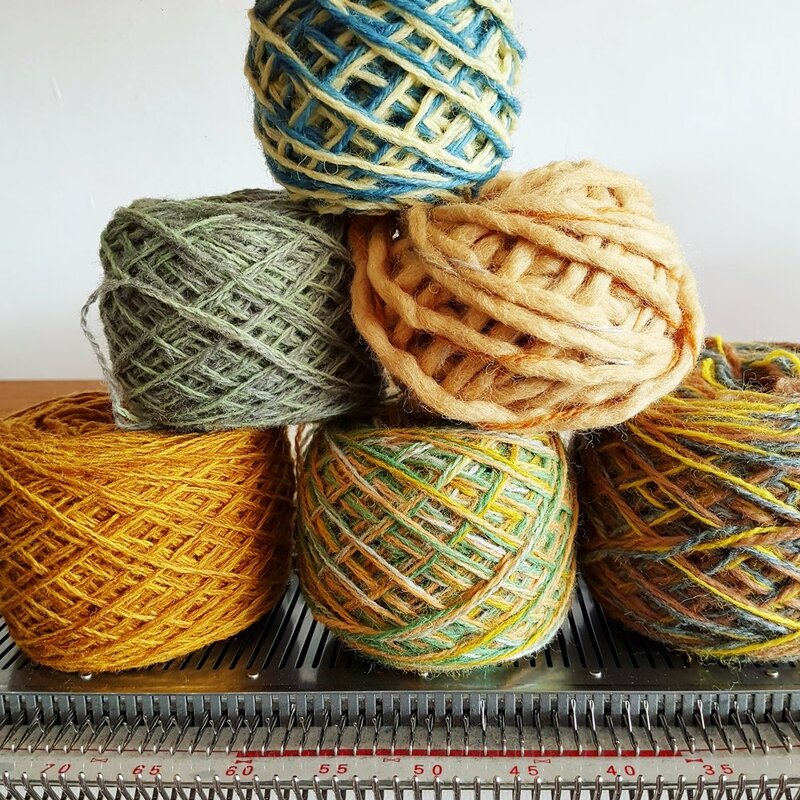 However, knitting the yarns together just by holding them doesn't result in the random effect you might expect from a marled yarn, as the position you are holding each yarn dictates whether it sits at the back or the front or the stitch. Burns, R. 2018. Yarn Twisting 1. Photograph. Burns, R. 2018. Yarn Twisting 2. Photograph. The machine works well for my needs to create new chunky yarns. It doesn't create a super tight twist (about 2 twists per inch), so it's not suitable for fine yarns (also due to the fact it is quite slow), but enough to create the random effect I had been looking for. The left hand swatch below contains 3 yarns of different weights, knitted into a sampler of stitch patterns to show the way the twisted yarns react to different knitted stitches. I'm very excited to make some new yarns out of old and produce unique colour and texture combinations! Burns, R. 2018. Yarn Twisting 3. Photograph. Burns, R. 2018. Yarn Twisting 4. Photograph. Burns, R. 2018. Yarn Twisting 1-4. Photograph.